Can't decide which bottle to go for? Grab both then! The nose is balanced with a poised freshness and a developed fragrance of Springtime undergrowth with quince, white peach & the floral notes of honeysuckle. Fruit-driven on the palate with great freshness allied to the fragrant fruits leading to good length on the finish. Delicate and fine bubbles. This is the perfect aperitif also a delicious accompaniment to white meats; veal escalope, fillet of pork or chicken tagine & fish; grilled sole, salmon en papillotte, roast monkfish. Beautiful pure aromas of fresh Summer berries combined with gentle pink rose petal & the freshness of tannin from Oolong tea leaves. A soft start of small, bright red fruit characters like raspberry & strawberry, rounded off with delightful notes from the Muscat grape. An ideal aperitif and moves perfectly into starters from foie gras to prawn cocktail. Works well with dishes like guinea fowl, duck or turbot & brings unexpected touch of freshness to desserts as well. Created by aesthete Rémi Rossano with the guidance of his winemaker friend, using carefully sourced grapes & all the skills of the winemaker to produce these three Non Alcoholic Sparkling. 1688 was the date of the original secret recipe for the Grand Rosé elixir, made by an old Bishop in Paris. It was Rémi who discovered the recipe in a book he had bought at an antiquarian book stall on the banks of the Seine in Paris, several centuries later. (Re-) Produced in France between Bordeaux & Nantes. 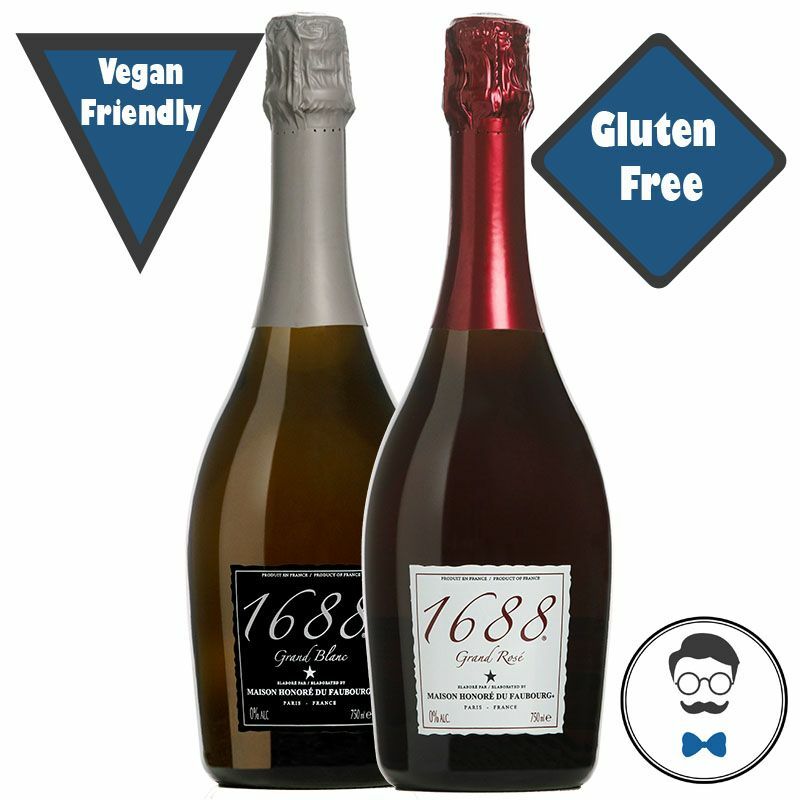 1688 Grand Cuvées are; 0.0% alcohol, 100% natural - no added sugars or sulphites, Vegan-friendly, Gluten Free and Halal certified.